So the fun has begun at Gardella Drive. We left the keys here last night in hopes that the remodel fairies would visit. THEY DID! 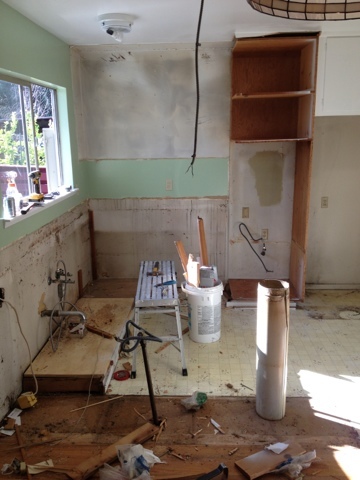 The once outdated mint green kitchen has been torn out (still some green residue on the walls though). The closet in the master bedroom also has a ‘small hole’ in it, we decided to knock that all out so we ( cough cough Emily cough) would have more closet space. It will be converted into a slightly larger master closet and slightly smaller guest one. But now looking at it I’m wanting to turn it into a master suite ;). Wishful thinking. I have loose measured the rooms so we can start picking out furniture this week and see what will fit. So all in all every thing is starting out great at the new abode. We will keep the posts coming throughout the process. Eventually we will put up some photographs too. A master suite eh?!?! Lol where will I sleep then??? ?